When your dog comes home wet or you just gave it a bath you want to dry it is fast as you can. We all know that a human hair dryer is not good to use on our dogs. 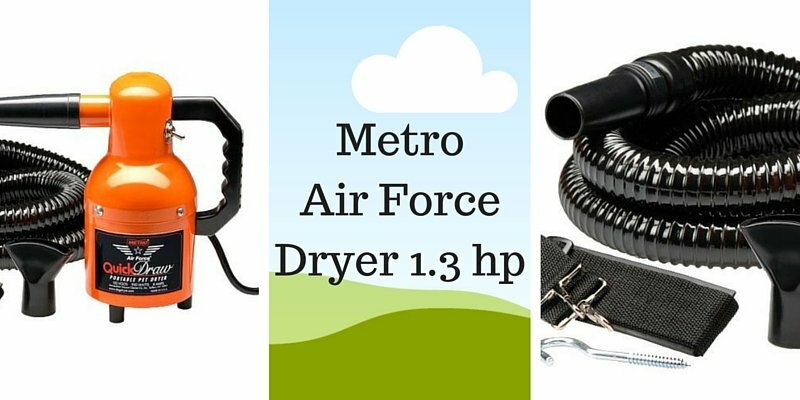 We have found the Metro Air Force Quick Draw Dryer as one of the top metro air force dog dryers. TIP! Reasons not to use a hair dryer made for humans is that they get way to hot! !A Metro air force dryer is made for pets. This type of pet dryers are not build to get hot. The only heat is coming from the motor and will just warm the air. the principle of a pet or dog dryer is to force the water out of their fur with air and not just dry it with hot air since this is not good for them. Especially on their ears hot air can cause damage. This Metro Air Force has a 1.3 horse power motor and this blows 18.000 feet or air per minute. This will blow the water our of your pets fur and cut drying time with about 70 percent. After reading a ton of reviews on a variety of sites and forums like we always do there are a few things you should realize about this air force hand dryers pet product. They are sometimes make more noise than a human dryer, but this is because the produce a lot more air and no hot air like I mentioned before. Some reviewers called this a con, but it is related to the product. The six foot hose in combination with the 12 foot cord makes it easy enough to have the unit far away from you and the dog. Need more hose length? One user recommended to add a normal household vacuum hose to the end and it will even have the unit further away from your dog if the noise scares him. The pointed attachment makes a high pitched noise and it will not go away. If your dog does not like the noise just stop using this attachment. Someone mentioned that he changed the angle of the hose and the high pitch was gone. the hose should stretch from 3 to 6 feet when you turn the unit on. If this does not happen you have to stretch it manually. There were a few professional groomers that left a comment that they use this unit all the time. I found that the feet break of easily so be careful when you set it down. For dogs with a thick fur like poodles it seems that it lacks a little power and it is better to use a 4.0 HP dog dryer like the Metro air force commander 4.0 HP we also reviewed. I have had dogs my whole life, but not any in the recent years. I wish I had one of these dog dryers at that time, because I always used towels and let the dogs dry by themselves after that. I was never happy with the smell of a wet dog. This dog dryer works great on all kind of dogs although it seems that for dogs with a thicker fur the Air force Commander with is 4.0 horse power is a better option. The weight is low enough to carry and use it as hand held device, but it might hurt your wrist after a while. The strap makes it easy to carry or use it to hang the dryer on a door or a hook to keep it of the ground since the feet under it seem a little brittle. Overall we can recommend this product as a great dog dryer. 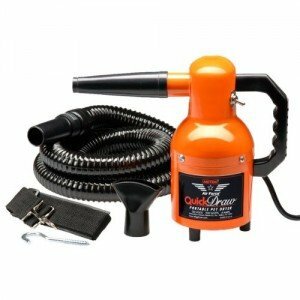 If you think you can dry your pets hair with a human hair dryer think again and check out the Metro Air Quick Draw Dryer. You can see all our high velocity dog grooming dryer reviews here.